Bruce wood floors redefine tradition by bringing affordable luxury into the home. Bruce is the No. 1 best-selling, most-recognized hardwood flooring brand in the world. The brand defines, and redefines, traditional styles that appeal to changing tastes and lifestyles. Founded by E.L. Bruce in 1884, Bruce Hardwood Flooring is the industry leader, widely recognized for American craftsmanship and a pioneering spirit. Bruce built its reputation on high-quality, solid-oak flooring, and still offers the widest variety of oak floors anywhere. 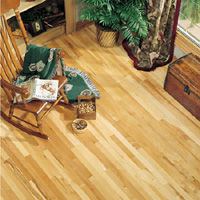 It was among the first manufacturers to offer pre-finished flooring. Bruce wood flooring continues to meet the changing needs of consumers today through a wide portfolio, offering a wide range of wood species in a variety of pace-setting floor styles, designs, widths and finishes – and long-term warranties. Bruce flooring adds a beautiful and natural touch. They also add value to your home and are highly praised in the resale home market. Today's hardwood floors have made advances in style, durability, maintenance and care, making them more widely usable throughout the home (with the exception of the bathroom where its use is not recommended due to potential moisture problems). Care of your new Bruce wood floor couldn't be easier. With simple sweeping or vacuuming and occasional spot cleaning, these wood floors will last a lifetime. There are hundreds of choices in style and color with today's options even spanning into exotic hardwoods. Most wood floors are available in several grades in a wide range of prices. Some common terms used in the industry are explained below for your convenience. Wood floors are available in a number of popular species, including oak and maple. Species such as pine, cherry, merbau, pecan, and other specialty woods are also available. There are two constructions of wood commonly sold. "Solid" wood is milled from one piece of wood. "Engineered" wood consists of three or more layers in a cross-ply construction. Solid wood construction is generally used when installing over a wood subfloor where the hardwood will be nailed to the subfloor. Engineered wood construction is generally used when the floor is installed in basements or over slab concrete where the hardwood floor needs to adhere to the subfloor. Woods styles come in strips, planks, or parquet tiles with numerous edge treatments such as square, micro, and beveled edges. You can choose from a wide range of stains to complement your décor and from two types of finishes: urethane or wax. Both can be enjoyed as soon as the floor is installed. Unfinished wood floors can be less expensive to purchase, again depending on grade and color. However, they are considerably more work to install, often require a professional installer and the finish may not last as long unless it is recoated every five to seven years. The technology of modern protective finishes has come a long way, making wood flooring more practical than ever. Urethane finishes are the most popular today because their ultraviolet light-cured finish allows for easier maintenance and longevity. Most finishes also contain aluminum oxide that enhances durability. Still, because of the nature of the material, wood is susceptible to scratches, dents and dings from high heels, household accidents and such. In this day and age, there is little need for sanding and refinishing a wood floor. Instead, you can just reapply the urethane finish every ten to fifteen years - which will revitalize the shine and make the floor appear new again. Wood floors should only be sanded or refinished if they suffer severe damage, or if you desire a new color. To keep them in good shape and looking new, it is necessary to clean a wood floor with a soft broom or vacuum. To maintain its luster, use the manufacturers recommended cleaner with a dry mop and a terry cloth cover. Urethane floors should never be buffed. Professional installation is generally recommended. However, depending on the type of wood floor, the size of the job, and how handy a homeowner you are, you may be able to do the job yourself. For example, if you're very handy and looking at installing a factory-finished floor in a small to medium-sized room, doing it yourself would probably not be too tough and will save you the cost of hiring a professional. For bigger, more involved projects, it would be worthwhile to leave it to a professional. For more information on Bruce flooring, please click on the links below.